Funeral services will be held Friday at 2 p.m. at the Woodbury Church of Christ for former Cannon County Sheriff Robert Simpson, who died Tuesday at age 75. Robert Douglas Simpson, 75, of Woodbury died February 16, 2010. He was born in the Burt Community of Cannon County on April 10, 1934. His parents were the late Hillary Simpson and Eunice (Jones) Simpson. He was also preceded in death by two brothers, Sterling Simpson and Alva Simpson and by three sisters, Dorothy Collins, Ellen Brandon and Opal Sanders. He is survived by his wife, Elizabeth Simpson; daughter, Virginia & Mitch Purvis; sister, Geneva Brandon all of Woodbury; six grandchildren, Jason & Gayle Owen, Josh Owen, Jesse Owen, Sean Owen, Nicole Owen and James Purvis; two great grandchildren & two step great grandchildren, Tessa Owen, Marley Owen, Silas Choate and Canden Choate. Mr. Simpson was a member of the Smith Grove Church of Christ. He served four terms as Cannon County Sheriff from 1964-1968, 1974-1978, 1986-1994. He also worked at the Cannon County Highway Department, serving as the Assistant Road Superintendent. He served as a Cannon County Commissioner. He was a charter member of the Middle Tennessee Mule Skinners Association. Simpson was first elected sheriff in 1964 and served two, two-year terms until 1968. 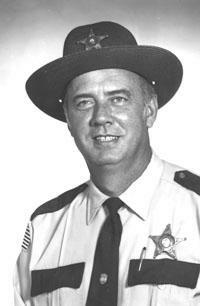 He was re-elected sheriff in 1974 and again in 1976 to two-year terms. Simpson was re-elected to the position again in 1986 and in 1990, serving two four-year terms until 1994. He was the last Sheriff at the old County Jail on West Water Street, which closed in March 1993, and the first at the new County Jail when it opened in March 1993. Simpson left office for the last time Sept. 1, 1994. He was the uncle of former Cannon County Sheriff Charley Brandon Jr.
"I first met Robert at the Colonial Shirt Factory in the early 1960s," current Cannon County Sheriff Billy Nichols said. "We were both working together and we became friends. He decided at that time that he wanted to run for Sheriff, he was in his late 20s or early 30s. People said he was too young and could not be elected. This was in 1964 and he won. He actually married my cousin. "Robert was a man who always had a smile on his face and if you met him on the highway he would always wave and throw up his hand to you. He would go out of his way to help the elderly people and see to their needs. Robert was a big imposing figure of a man but had a warm and gentle heart. "Robert could arrest you today and still be your friend tomorrow. People liked and respected him. He could do the job, if he came to arrest someone he could do it the easy way or the hard way, that was to up to you. If he came to get you, you left with him. "In 2006 when I decided to run for Sheriff I went and talked with Robert and he gave me a lot of good advice. He was good politician and was a wealth of knowledge. I asked him often about his thoughts on politics and he was always correct in his answer. Through the years he advised hundreds of candidates. condolences in this time of sorrow. Another former sheriff, Bob Stoetzel, said Simpson will be missed by people throughout the community who knew him. "I was sorry to learn of the death of former Sheriff, Robert Simpson," Stoetzel said. "His passing will leave a hole in the law enforcement community in Cannon County. Robert held the office longer than any Sheriff in Cannon County. He had a unique ability to remember people's names and called them by their first name every time he met them and rarely used nick-names. This trait served him well in his tenure as a sheriff and working in the community. My family will miss him and wish his wife Elizabeth well." Visitation will be held at Smith Funeral Home on Thursday, February 18, 2010 from 3-8 PM. Visitation on Friday, will be at the Woodbury Church of Christ from 11-2 PM. Funeral services will follow at the church at 2 PM. Herb Alsup and Doyle Sadler will officiate. Interment will be in Riverside Garden. Pallbearers will will Josh Owen, Jesse Owen, Jason Owen, Bobby Simpson, Billy Simpson and Jimmy Simpson. In lieu of flowers the family requests donations to the Smith Grove Church of Christ Building Fund or Cannon County High School Athletic Dept. Contact Smith Funeral Home to make a donation. (615)563-5337. www.smithfuneralhomewoodbury.net. Our thoughts and prayers are with The simpson family... Robert was such a nice man and always knew everyone by name.. he will be missed by all but he leaves many fond memoroes and a legacy here in Cannon County. we love you Robert..may you be at peace now in heaven with Jesus! Our prayers are with your family... Robert was always nice and kind. I know I have heard my parents, Grandparents, and Family talk about how great of a man he was... I remember going and visiting with him awhile back when he was at home... he loved company... my family would sit and talk with him for hours. Our sympathy is with the family and everyone that knew him.